Please feel free to read the testimonials provide by current and previous customers. Should you wish to talk to a previous or current customer we can pass on deatils upon request. This firm has cleaned out the pond in my garden for the last three years. 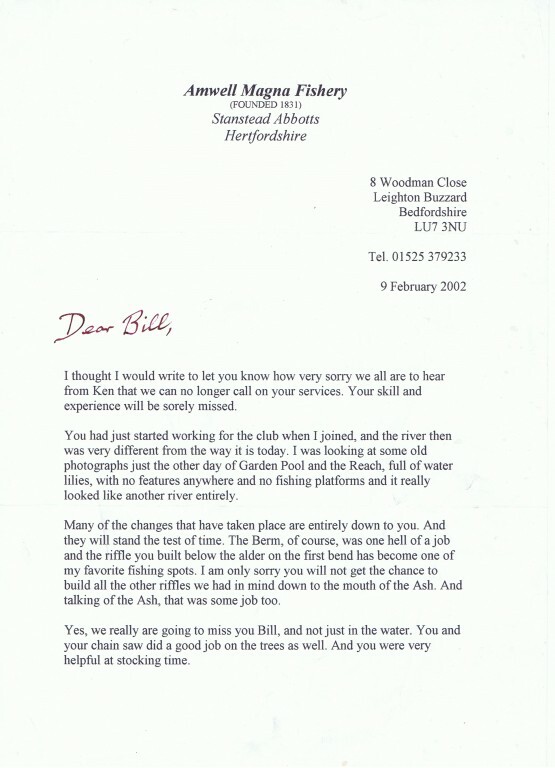 The owner, Billy Hancock, is a friendly, efficient and highly skilled aquatic worker. He always arrives at the time agreed and sets about unloading and installing his equipment with minimum fuss. He takes care to place the fish, frogs and newts in a holding tank of clean water while he drains the pond before both power-hosing and scrubbing down the lining. He carefully removes the plants and ensures their roots are pruned before they are replaced. He cleans the pump out and checks that it is left in good working order. 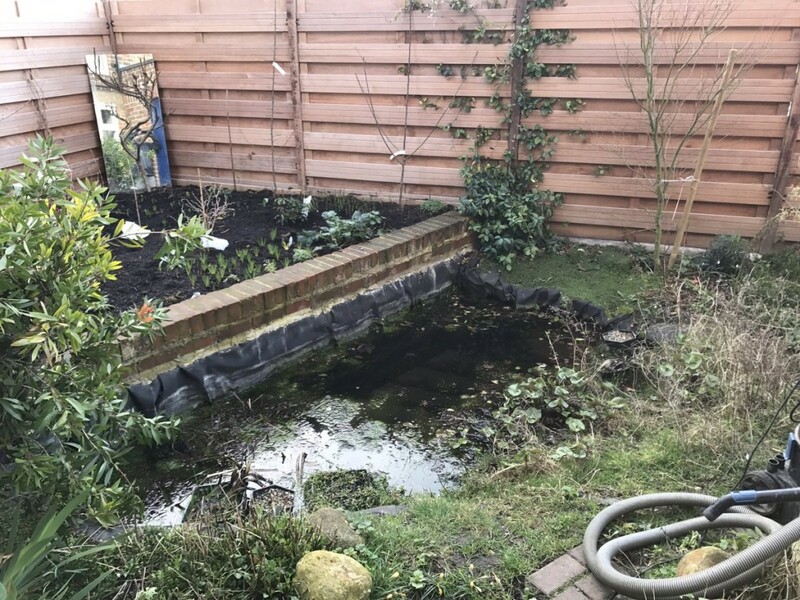 He is always willing to offer helpful and knowledgeable advice about any aspect of pond maintenance (suitable plants, the most appropriate pumping and filter system, and the care of pond life generally) should you need it. He leaves the pond surrounds clean and tidy when he departs. I have already booked in my annual spring clean for next year, which helps us both to plan ahead. 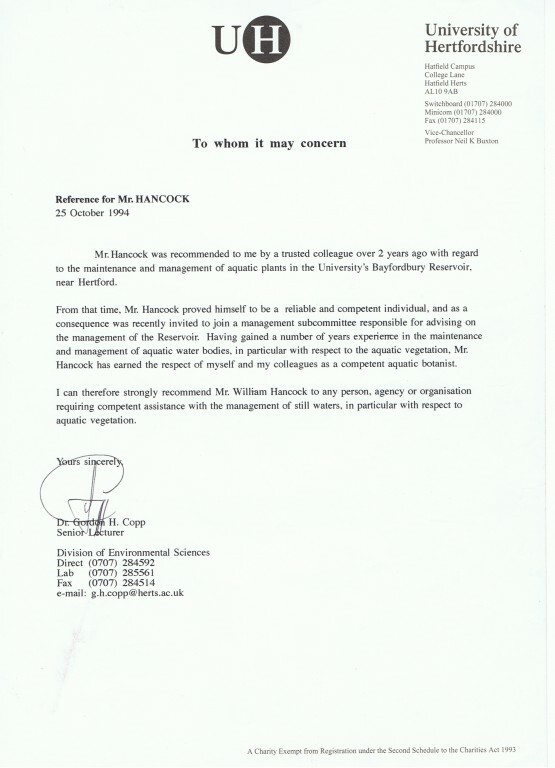 His is altogether a most professional firm and I have no hesitation in fully and strongly recommending Billy Hancock to others. Professor Ian Gordon, Cambridge. My inner city pond was in a very poor state, full of bubbling methane, silt and rotting vegetation, and with almost nothing except blanket weed alive in there. Billy did a superb job cleaning it out and re-housing my various water plants. Even better, he was able to save the water in 2 big tanks on the street (the neighbours were very interested) and pump it back in, thereby avoiding chlorinated water. I can now watch the plants on the bottom growing, 5 feet down. Many thanks Billy, a highly recommended service. We at Brickendon grange golf club would like to thank Billy at h2oplants for his service and help in carrying out the installations of the two fountains on the golf course. It was good working with u and the support before they were installed to make sure we got the correct units. 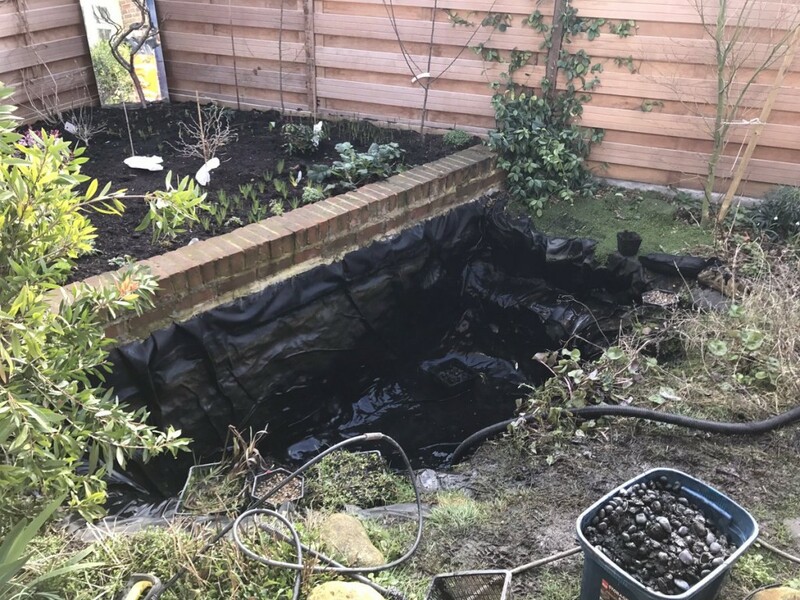 We would highly recommend h2oplants and we shall get you back to sort the other ponds out, and possible more in the future. Ps the lads said if u fancy a dip in the pond again you’re more than welcome. Many thanks Lewis Mattholie and team at Brickendon Grange Golf club. H2O Plants have given outstanding service and I can highly recommend them. I have recently had the wonderful Billy clean both my ponds which was certainly needed they now look spectacular thanks to him. He is such a nice friendly person and no job is too small or big he just gets on with it and if you have a slight problem and phone him he will talk it through with you which is a great help. I cannot thank him enough for making it so easy for me to manage and anyone who needs pond assistance should contact Billy every pond owner should have him. I needed help with the pond after my husband died and Bill was so very efficient and helpful, a credit to the company. It put my mind at rest knowing the fish were going to a good home and such a help getting the pond drained. I could then get family to help fill it in and turn it into a beautiful area in the garden. Thank you Bill. Would definately reccommend this company to anybody. To whom it may concern. We have used Billy’s services for a couple of years covering two ponds, one 3,250 gallons and a second 20,000 gallons. and the larger a number of fish breeds all of significant size. The latter pond has heavy water planting supplied by Billy. 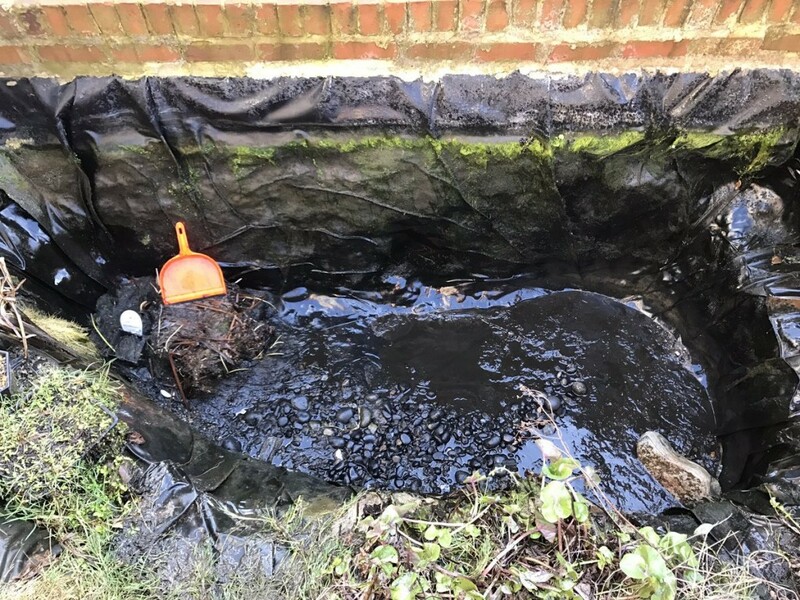 Billy looks after the ponds generally including the water quality, filtration systems, planting and all ancillary functions. In all dealings we have found Billy to be proficient across the full spectrum of services and to be highly knowledgeable. He is easy to work with and always happy to give an opinion or advice over the phone, inside or outside of normal business hours. We have no hesitation in recommending Billy for all pond construction and maintenance matters. Mr Nigel and Ms Ellen Dentoom Hutton Mount Brentwood ESSEX"
Great, friendly and efficient service from Billy. Helped us cure a parrots feather issue in our pond and fitted a marvellous fountain! I am Thoroughly pleased with the service Billy provides in maintaining our fountain. He is always reliable and very knowledgeable about his job and always gives great customer service! Thanks to him our fountain has remained in very good condition and continues to work well! Our pond was in a sorry state, overgrown with reeds, the pump not working, hence the cascades not working. H2O plants removed the old vegetation, cleared out the pond, took care of the wildlife, mainly newts, and set about restoration. It was a professional job, with the results being extremely pleasing for our residents and staff. Moving water, rippling sounds a calming and restful experience for us all. "When I had problems with my fish pond I had been looking for a London based company but could not find one I liked. 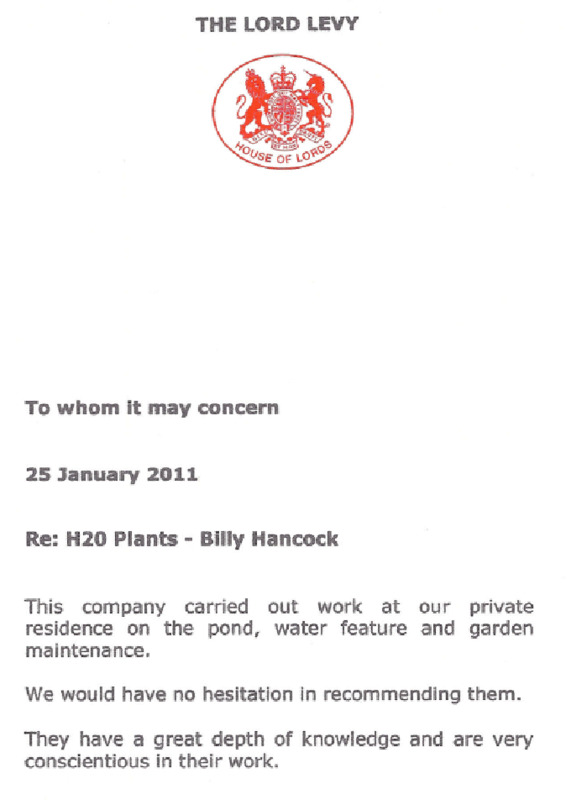 I then contacted Billy Hancock of H2O Plants who was able to fix the problem with great speed and competance. 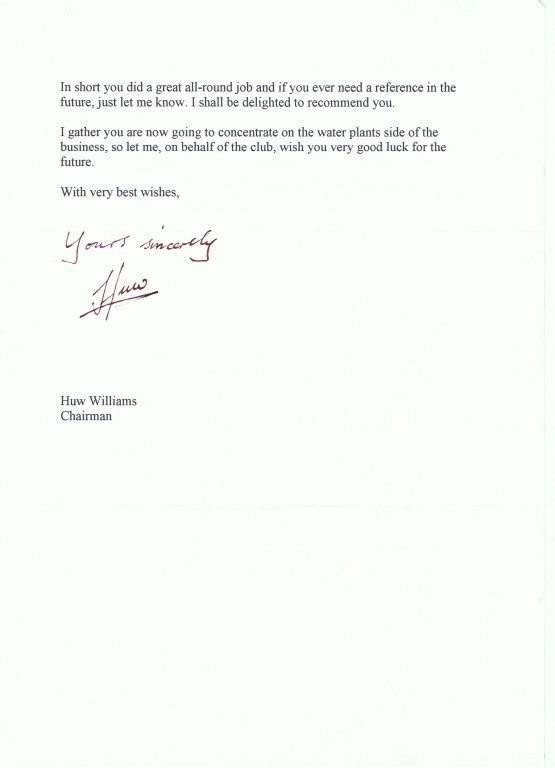 The pond is now running perfectly and I am extremely happy in every respect with the services provided by H2O Plants." 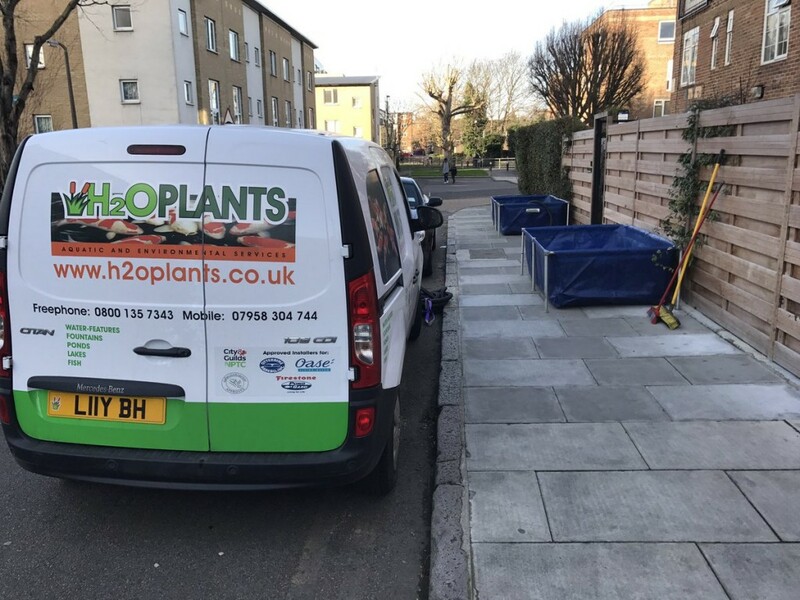 H2O Plants have always provided a first class professional service at extremely competitive rates who have gained my trust and respect due to their diligent nature and efficient response. As a company they are extremely passionate and knowledgeable about their field and I would have no hesitation in recommending their services.
' A joy to encounter! your pond problem will be handled punctually, efficiently, and obligingly. The solution will be diagnosed quickly and amazingly the parts to solve the problem are carried on board. No hesitation in recommending H2O Plants I received 100% satisfaction. Vivienne ......Little Easton. Billy was recommended to me by a mutual friend as Ineeded someone to help move my koi from my old house to my new house	about three years ago. After a telephone conversation he visited my home, looked at the pond/fish and said the job was not a	problem for him and when would i like it to be done? He seemed very confident baring in mind some of my fish were over 40lb! The day of the move came and Billy arrived with his transportation tanks with oxygen and every fish was moved with great care and expertise. The job was made to look easy by someone who knew what he was obviously doing. The new pond that I built had been up and running for two summers by the next time I called Billy due the fact that I had been getting plagued with blanket weed ever since its first months and this was causing the Japanese matting to get pushed out of the filters	and overflow in my pump room, the bottom drains were becoming blocked and the pond didn’t look how i wanted it or how it should have looked. I called Billy to come back, have a look and give me his advice on why he thought this was happening. Straight away he look at the	filters i had been recommended to install by a well known aquatic centre and stated that they weren’t man enough for the job. I	asked him to work out what he thought would solve the problems and come back to me. A few days later the quote came back with his recommendations. The equipment was all state of the art and included the use of centrifugal filtration and a bead filter in replacement to some of the	old vortex chamber filter units i had. This type of filtration were new to me so i asked Billy what type of guarantee he would give as to whether it would solve the previous. issue of the blanket weed growth	“If it doesn’t work I’ll give you your money back!” came his reply. I couldn’t really lose so I commissioned him to carry out the proposed works. The start of the works arrived and Billy and his team turned up, set up a holding tank with filtration, drained the pond, moved the koi	to the holding tanks, cleaned the pond, unblocked the bottom drains by jetting them out and removed the old filtration that was not	needed on day one. Day two arrived and the installation took place of the new superbead filter (inclusive of bacteria to quickly mature the filter),	multicyclone filter, new filter media to the existing vortex chambers, the quartz sleeves were cleaned and the bulbs on my UV clarifier	units were all replaced. The pond was now ready to re fill so on went the de-chlorinator cartridge and the tap was switched on. Day three and the pond was filled up and the new equipment was ready to be put into action. Billy switched on the pumps and	everything was working fine. Over the next week Billy returned on a daily basis to install a few fish at a time to the pond and take water quality tests to make sure	everything was going to plan. 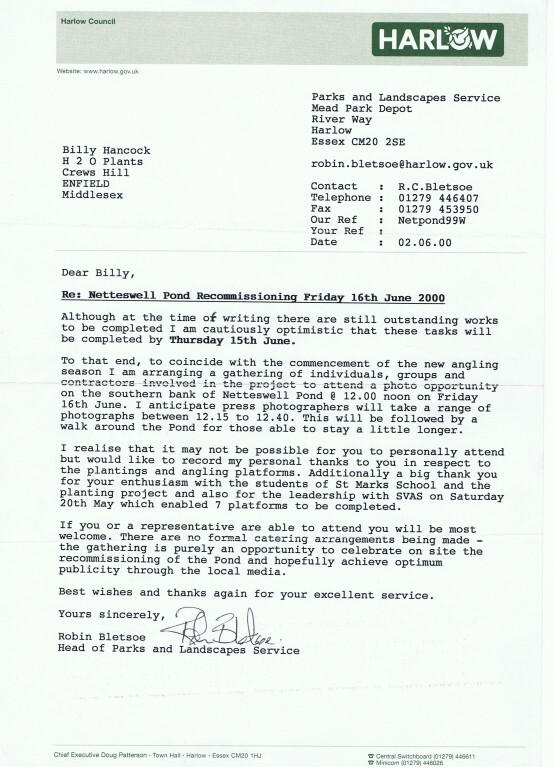 Once the works were finished Billy invoiced me and the works had came in under the original cost as he had done the project in	under the time he had first said which is always a bonus and not very common today. Billy now visits the pond every other week throughout the year to carry out the regular pond maintenance, the blanket weed has	never returned, my fish look better than ever and i have also just commissioned him to fibreglass another pond on a project I'm	working on at the current time. Using Billy and his team to either build or maintain your pond will be the best choice you make! We have a few clients who would like some plants for their pond, but we are not green fingered so are looking for your advice. Saw the Oxford lake yesterday - it looks great, client is over the moon - Thanks !! !